Since I am planning on eating more weeds, it seems appropriate that I review this book. 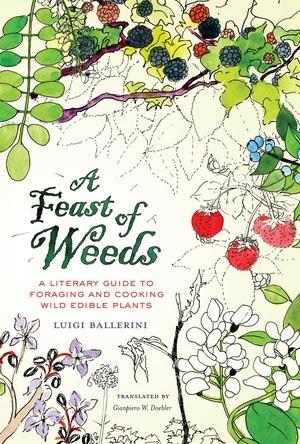 Not to be confused with Feast of Weeds, a series of apocalyptic novels about a world-ending plague, A Feast of Weeds, by Luigi Ballerini is tangentially about foraging and cooking wild, edible plants. I say “tangentially” because it’s not like other foraging guides. This is a “literary guide,” as the subtitle states, so in the place of plant descriptions and harvesting tips, etc. are verbose and erudite essays summarizing the various literary references that each of the species profiled has accumulated from antiquity to the modern era. Apart from dozens of recipes, the information presented in this book is more entertaining than it is practical; however, when telling the stories of plants, the human element is an important facet – particularly in the stories of edible and medicinal plants – and it is the human element that this book is concerned with. A selection of recipes accompanies each of the plants that Ballerini writes about. These recipes were “invented or elaborated” by Ada De Santis, who lives on a farm in the “heel of Italy” and who “enthusiastically agreed to divulge the secrets of her kitchen.” Ballerini partnered with De Santis because of her Italian ancestry and her vast experience with both wild and cultivated plants. Each chapter in the book follows the same basic format: a discussion of the myriad references a certain plant has received in various writings throughout human history, an overview of the (often bizarre) medicinal uses the plant has had throughout the centuries, and a brief statement on when to harvest the plant. References include plays, poems, songs, myths, fiction and non-fiction, religious and sacred texts, medicinal plant guides, and even artwork. Reading through the book, my interest and attention waned often, partly due to Ballerini’s way of writing and also due to my lack of familiarity (and lack of interest, frankly) with the references. But there were enough interesting bits here and there that made it worth the effort. 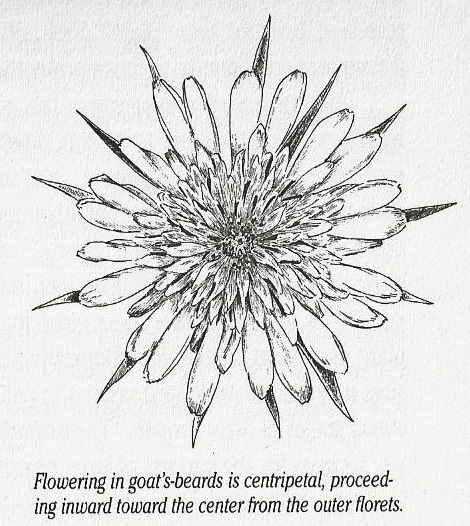 A couple of paragraphs about dandelion (Taraxacum officinale) find their way into the chapter about wild chicory. The rosettes of these two plants look similar, and the roots of both, when “roasted and ground, can be used as a substitute for coffee.” Dandelion is also known to be a diuretic, and is thus referred to as pisciailetto in Italy, pissenlit in France, and piss-a-beds in England. While the bulk of this book is of little use to me – I guess I’m just not that interested in classic literature or mythology – it’s worth keeping around for the recipes alone, several of which I am anxious to try. If the idea of an unconventional field guide appeals to you, this book might be up your alley, just as it apparently was for this reviewer. 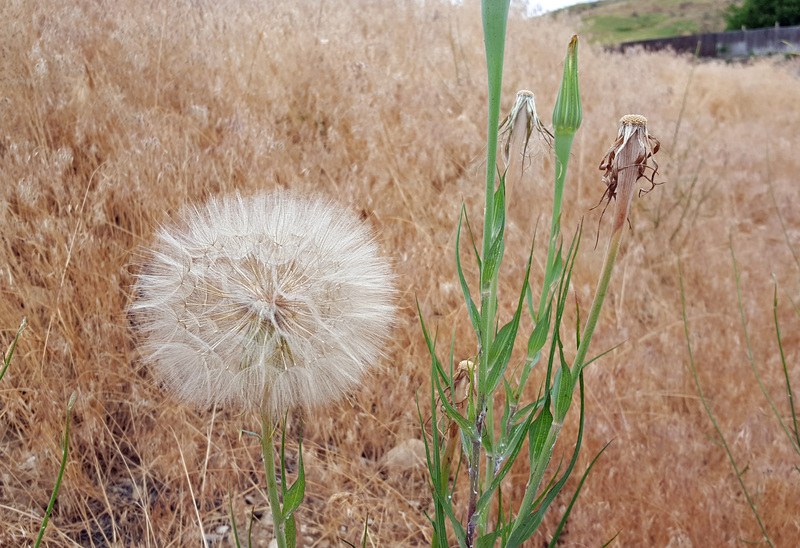 Last year during the Summer of Weeds I inadvertently wrote about several edible weeds, one of which I even ate. 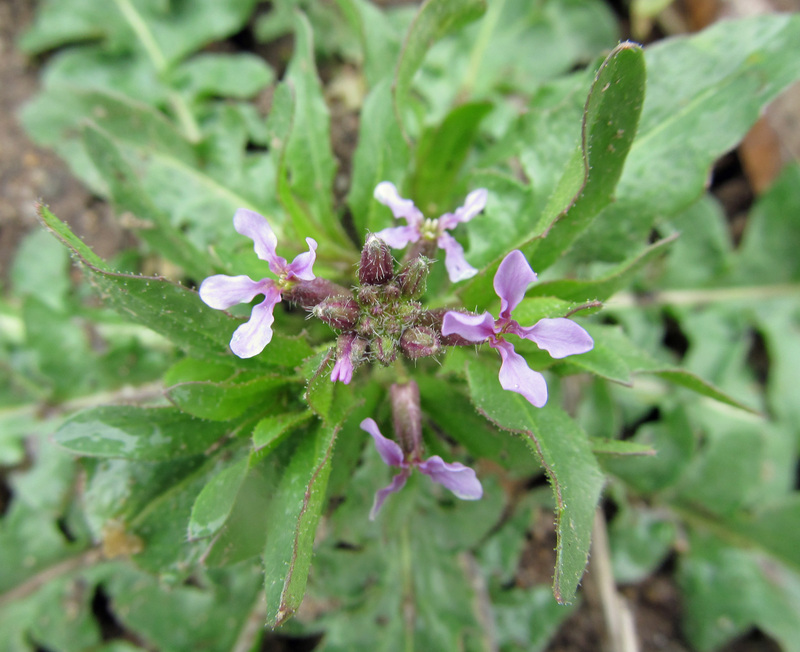 It’s not surprising that so many weeds are edible; there are plenty of plants out there – both native and introduced – that are, despite the fact that most of us stick with whatever is made available at the grocery store. 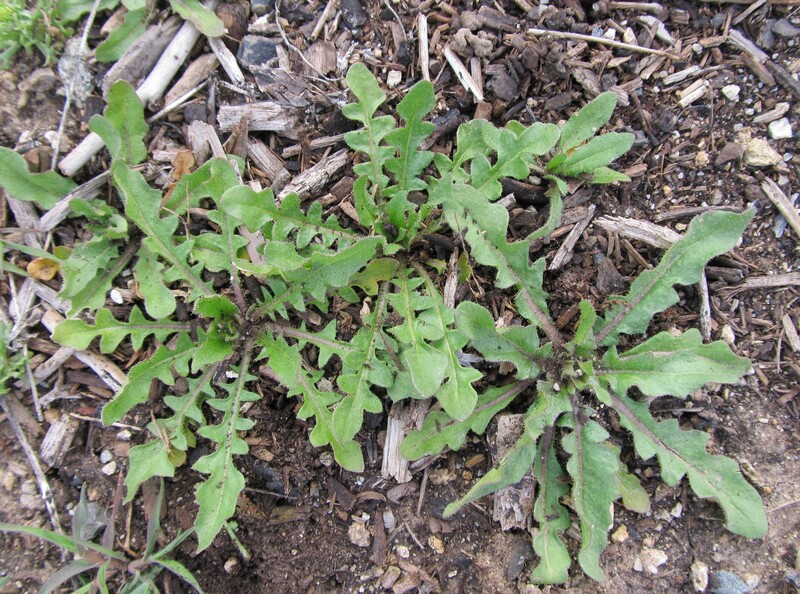 Some edible weeds, dandelion included, were once commonly grown for food, while other weeds are close relatives of present day agricultural crops. The more I read about these things and the more my weeds obsession grows, the more I feel compelled to eat them (the edible ones, at least). 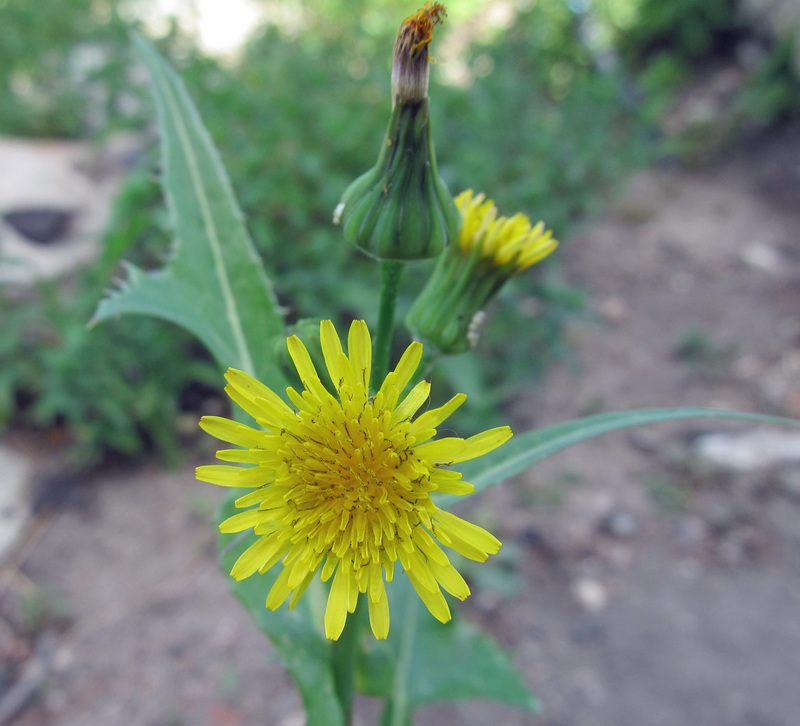 Hence, a new series of posts: Eating Weeds. I might as well start with an easy one. 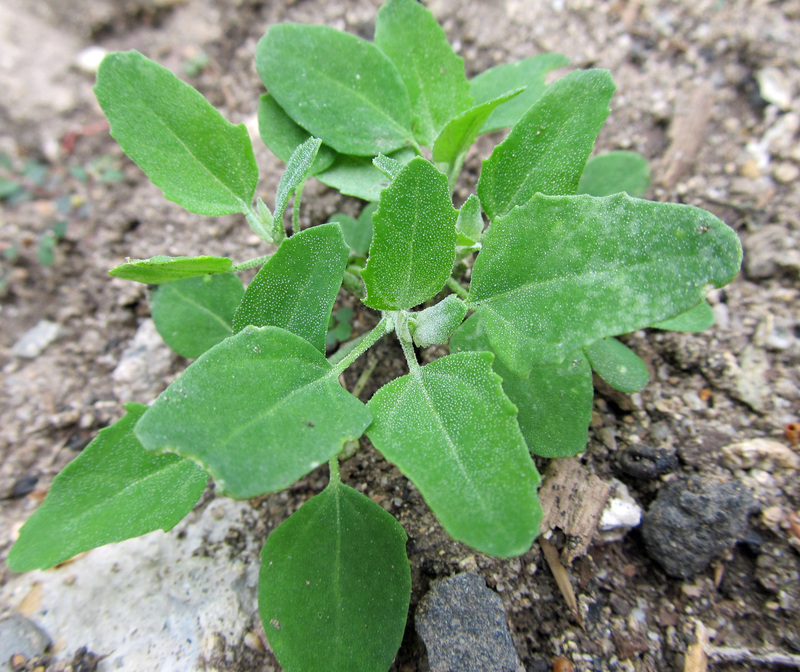 Chenopodium album, or lambsquarters, which I wrote about last summer, is a close relative of a number of common crops and a spitting image of quinoa. It happily grows alongside other plants in our vegetable gardens without even being asked to. 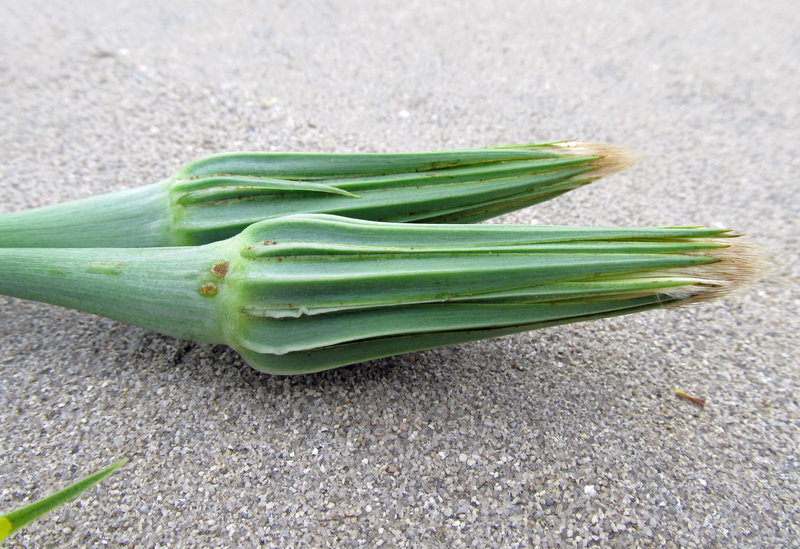 It is highly nutritious and palatable – particularly the young leaves – and can be eaten raw or cooked. It is often compared to spinach and can be prepared and used in similar ways. For the purposes of this post, I decided to try lambsquarters pesto. While pesto is traditionally made using basil leaves, all kinds of other leaves – or combinations thereof – can be substituted. 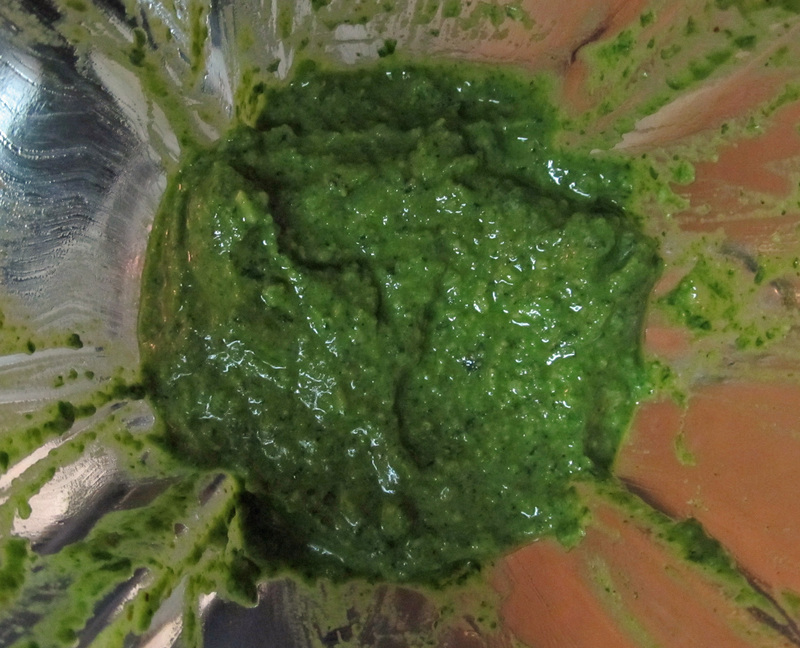 I have made pesto with parsley, which was interesting, as well as watercress, which was delicious. The possibilities are endless. So, why not lambsquarters? Making pesto is incredibly simple. Blend together a combination of leaves, garlic, nuts or seeds, Parmesan cheese (or something similar), olive oil, salt, and pepper. Pine nuts are traditionally used to make pesto, but like the leaf component, a number of different nuts or seeds can be substituted. I rarely make pesto with pine nuts because, despite being delicious, they are pricey. I made two batches of lambsquarters pesto. For the first I used walnuts, and for the second I used sunflower seeds. Both batches were delicious. How could they not be with all of that garlic and cheese in there? Lambsquarters is not a very bitter or strong-tasting green, so lambsquarters pesto might be perfect for anyone who is otherwise not fond of pesto (although that is a stance that I personally cannot fathom). This is definitely something I will make again. I understand the frustration people have with lambsquarters. It can be prolific and hard to eliminate from a garden. Luckily, it makes an excellent pesto. This series of posts was inspired in part by the book Dandelion Hunter, in which the author, Rebecca Lerner, attempts to go a full week eating only things she is able to forage in her hometown of Portland, Oregon. 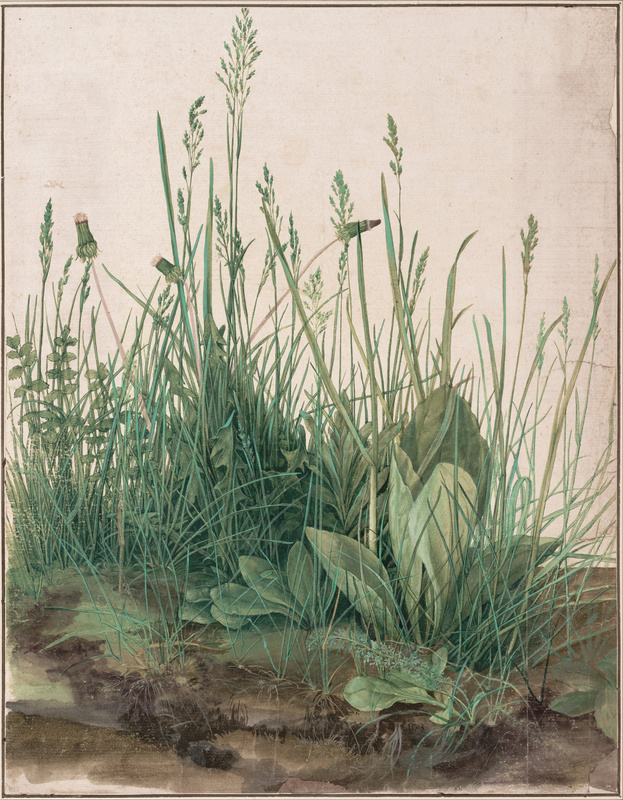 As you might imagine, many of the plants she forages are weeds. If it wasn’t so prolific and persistent, purslane would probably be a welcome guest in our vegetable gardens and edible landscapes. Easily among the most nutritious and versatile of the edible weeds, Portulaca oleracea is an annoyingly abundant annual that has inserted itself into garden beds and croplands in temperate climates across the globe. Thought to have originated in India or somewhere in Eurasia, purslane invaded North America long before Europeans did and has been naturalized across much of the continent for hundreds of years. There are over 100 known species in the genus Portulaca, the only genus in the family Portulacaceae (otherwise known as the purslane family). Common purslane is a succulent plant with paddle- or teardrop-shaped leaves that generally grows low to the ground, forming a thick mat. It reaches for the sky when grown in shade or when competing with other plants for space. 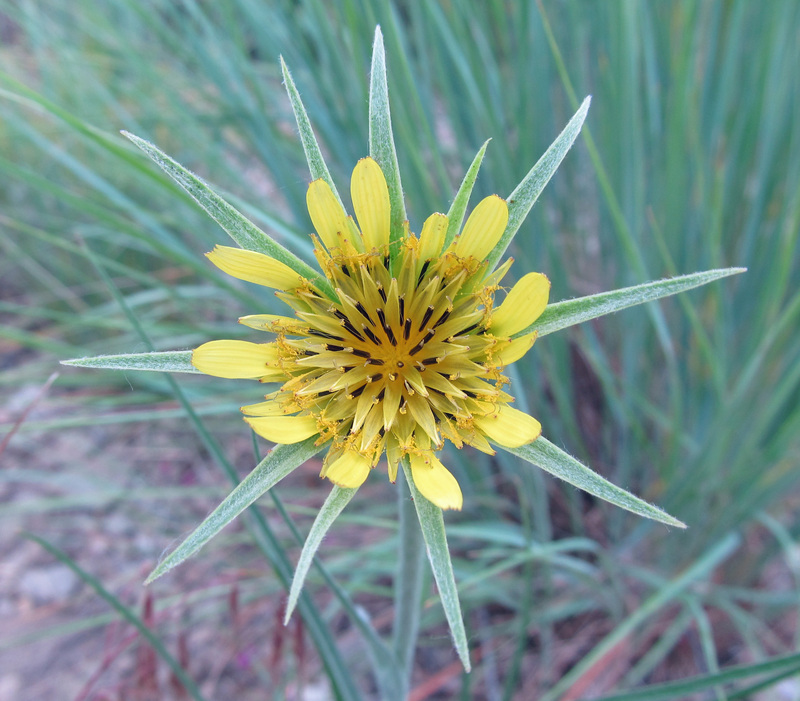 It produces little, yellow flowers that only open in bright sun and are typically self-pollinated. 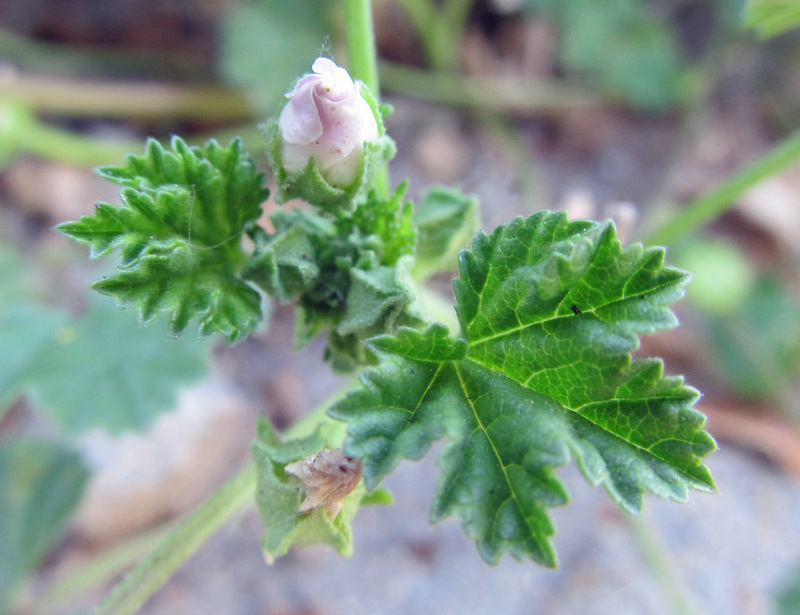 A small capsule containing dozens of tiny, black seeds quickly follows each flower. 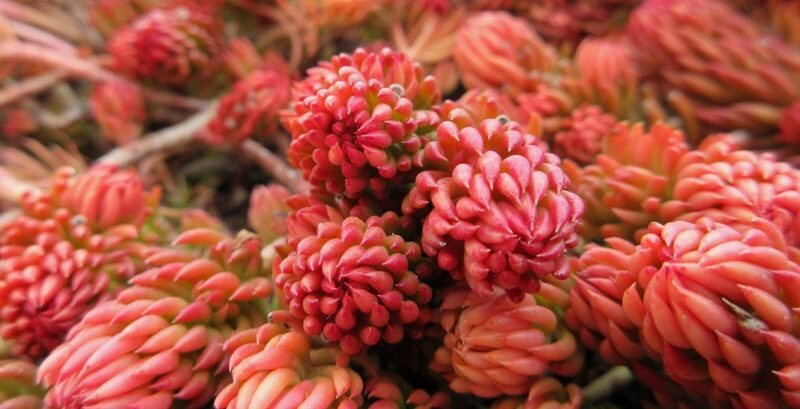 Each plant can produce tens of thousands of seeds, which remain viable for around 40 years. 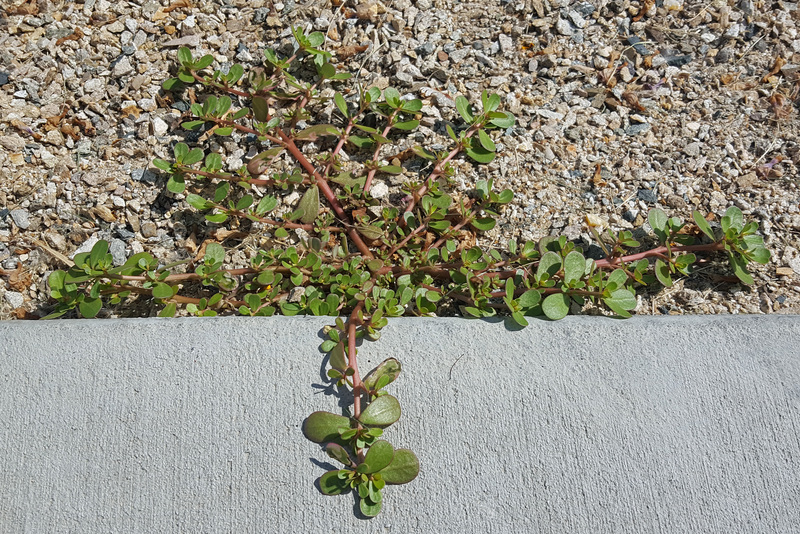 The ever-urban and ever-common purslane. With that caveat in mind, I tried it anyway. 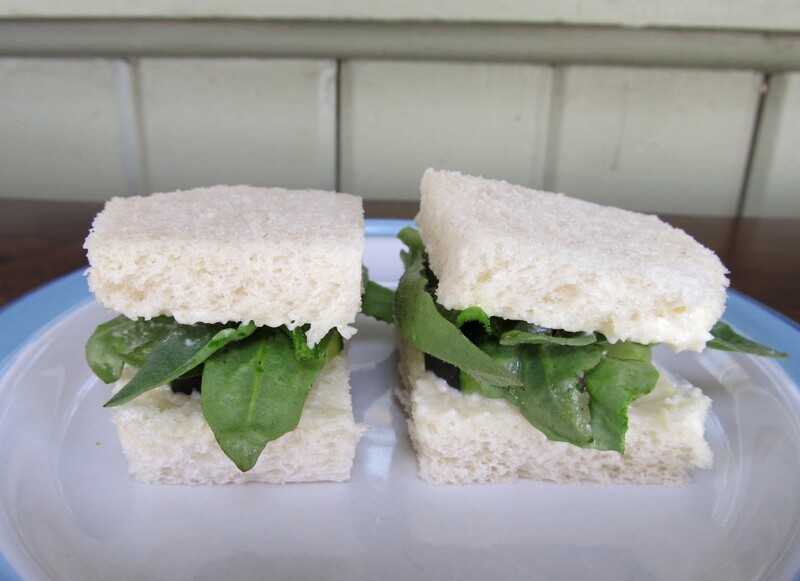 I had eaten it before, but nothing more than a leaf here and there and once in a green salad. I picked two recipes to try: Walnut Purslane Coleslaw from The Wild Wisdom of Weeds and Potatoes and Purslane from A Feast of Weeds. 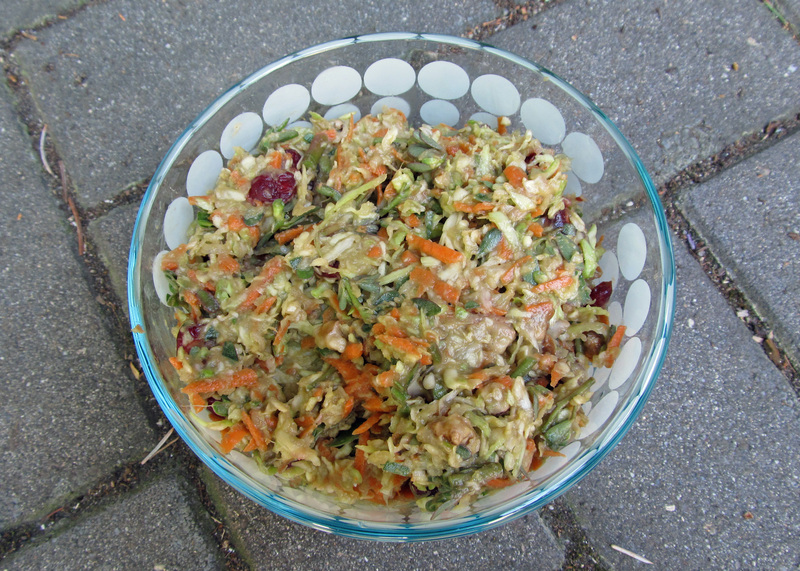 I’m generally a big fan of coleslaw, but for whatever reason I found this recipe to be a little bland. It was missing something, but I couldn’t put my finger on it. The purslane seemed to add a vague slimy-ness to it, which it will do on account of its mucilaginous nature. 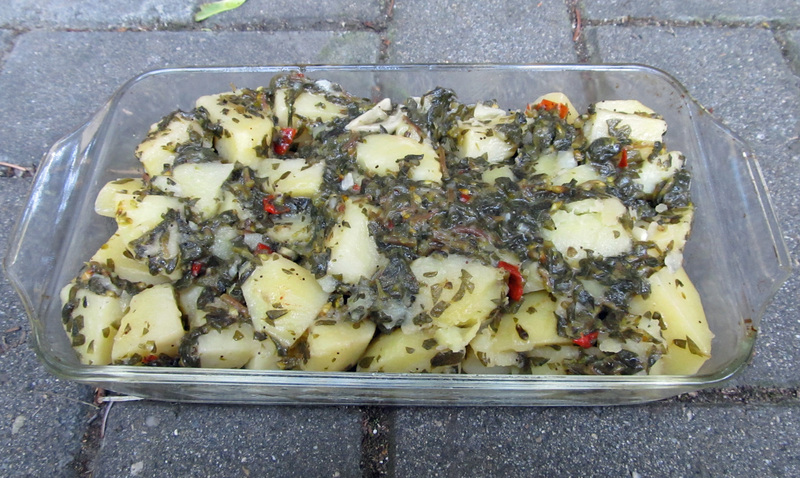 The Potatoes and Purslane recipe involved cooking the purslane. I enjoyed the finished product both hot and cold. The purslane added a sort of lemon-y spinach flavor. Those who tried it with me also liked it. The potato recipe was made with purslane that had been harvested in the morning, which may explain the strong lemon-y flavor. The coleslaw was made with purslane harvested in late afternoon, which may explain its blandness. I will have to try it the other way around for comparison. Purslane recipes abound in books and on the internet; browsing through them, I am intrigued enough to consider trying others. I think I’ll start with pickled purslane, purslane pesto, and perhaps, purslane sauerkraut. 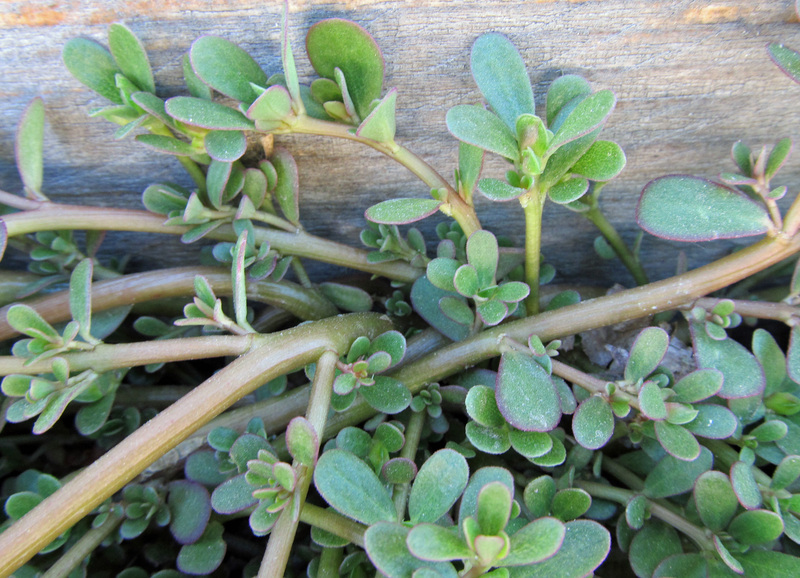 Do you have a favorite purslane recipe? Share it in the comment section below.